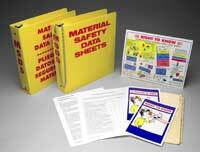 Title: 02/07/1990 - The transmittal of material safety data sheets (MSDS). This is in response to your letter of January 26 to the Occupational Safety and Health Administration (OSHA), on behalf of your constituent, Mr. Ernest Isenberg, President of the Western Extralite Company in Kansas City, Missouri. Mr. Isenberg wrote to you concerning the transmittal of material safety data sheets (MSDS) as required under OSHA's Hazard Communication Standard (HCS), 29 CFR 1910.1200. Mr. Isenberg specifically was concerned about the requirement for distributors to provide MSDS to downstream users of hazardous chemicals. The HCS requires MSDS to be provided by the chemical manufacturer and downstream distributor only at the time of initial shipment or when the MSDS is updated or changed to contain new or significant information about the chemical's hazards. Mr. Isenberg would like OSHA to require that an MSDS be included with every package of chemical product and/or for OSHA to require "labeling the product to include MSDS information." Mr. Isenberg feels such a requirement would "provide greater safety as the precautions needed to be observed in usage and in case of accident are available at the point of use, and each time it is used." Distributors are responsible for copying and sending MSDS to downstream employers. When a distributor receives only one material safety data sheet for each container of hazardous chemicals sent to him and he then subdivides the chemical into smaller containers and sends them to several downstream employers, that distributor is responsible for sending a MSDS and a label with each new, (smaller) container he ships. OSHA realizes that this requirement of the HCS to supply MSDS and labels to the customers Mr. Isenberg distributes hazardous chemicals to has imposed additional paperwork burdens on him. However, as stated in the standard and as recognized by your constituent, the unimpeded downstream flow of hazard information is key to achieving the goals of the HCS. Distributors' transmittal of the MSDS and appropriate labels provide downstream employers with the information they need to inform and train their employees properly and to design and put in place employee protection programs. It also provides necessary hazard information to employees so they can participate in, and support, the protective measures in place at their workplaces. Under the HCS, employees must have ready access to the MSDS information. In the construction example Mr. Isenberg utilizes in his letter, it is the construction worker's employer's responsibility to maintain current copies of MSDS in a central location on the worksite in any manner that ensures that employees are able to refer to them while they are in their work areas during all workshifts. This may be accomplished in any manner, by keeping a hard copy of the actual data sheets themselves, or by the use of computer terminals, a microfiche machine or telefax. The key to compliance with this provision is that employees have no barrier to access the information and that the MSDS be available during all workshifts. It is also the employer's responsibility to keep his MSDS file up to date and to ensure that the list of hazardous chemicals that is to be maintained in the workplace as part of his hazard communication program reflects the MSDS currently in use at the worksite. Since an employer only receives a new MSDS when the product changes or information on the data sheet is updated, the receipt of a new sheet from his supplier indicates to the employer the need to update his MSDS file and the list of hazardous chemicals. Also, since training has to be provided to affected employees when new hazards are introduced into the workplace (not necessarily new chemicals), the receipt of a new MSDS compels the employer to scrutinize the data to ascertain if the new product represents a new health or physical hazard to his employees for which he would have to provide additional training. The transmittal of a new MSDS with every package of hazardous chemicals would make it extremely difficult for the employer to keep track of the arrival of a new chemical hazard into his workplace operations. Under the HCS, the purpose of the label is to provide an immediate hazard warning to employees using hazardous chemicals. The label and MSDS must contain the identical name, enabling them to easily be cross-referenced with each other. It is the purpose of the MSDS to contain much more detailed information about the chemical, including "remedies" for first aid situations that Mr. Isenberg refers to in his letter to you. Including too much information on the label defeats the purpose of the intent of the labeling requirement to provide an immediate hazard warning. In summary, an effective hazard communication program involves more than just the provision of MSDS to employees. An effective hazard communication program is one in which all elements of the standard are addressed, including the maintenance and accessibility of MSDS, the labeling of hazardous chemicals in the workplace and the provision of employee information and training. I hope this discussion will be useful to Mr. Isenberg in understanding the Agency's intent behind the promulgation and enforcement of the MSDS and other provisions of the Hazard Communication Standard. Please feel free to contact us again if we can be of further assistance.